Each September, SBANT hosts a WalkNRoll. The Walk-N-Roll is a family-friendly 1/2 mile walk around Burger’s Lake. The purpose is to raise funds and bring Spina Bifida awareness to the community. It is followed by a day of fun for our participants and supporters. Visit www.walknrollforsbant.org for more information! www.walknrollforsbant.org – Registration is now open! 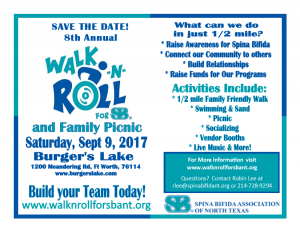 Join us on Saturday September 9, 2017 for the SBANT Walk-N-Roll and Family Picnic at Burger’s Lake benefitting the Spina Bifida Association of North Texas! After the family-friendly 1/2 mile Walk, stay for a fun day of swimming, entertainment and socializing! Meet sponsors, make new friends and spend a day with the Spina Bifida community. Last year, we raised over $55,000 and had over 600 people in attendance! Let’s make 2017 the best year yet! All donations are tax-deductible and a receipt will be provided. An offline donation form is available by clicking donorform-individual. If you are supporting a particular individual, please indicate this on the form and check so they will be credited properly. To save us money and to receive your receipt quickly, please provide us with your email address. 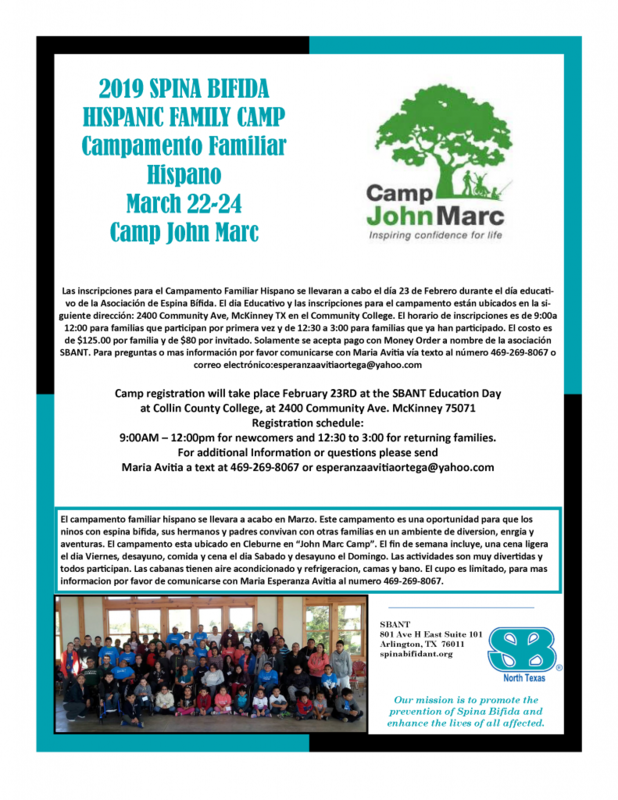 Please contact Robin Lee at rlee@spinabifidant.org or 214-728-9294. Thank you for supporting the Spina Bifida Association of North Texas! Interested in being a Sponsor? Click on WNR Sponsorship Proposal 2017 for Sponsorship Brochure or contact Robin Lee at rlee@spinabifidant.org.